On Thursday afternoon, five students at Bayview High walk into detention. Bronwyn, the brain, is Yale-bound and never breaks a rule. Addy, the beauty, is the picture-perfect homecoming princess. Nate, the bad boy, is already on probation for dealing. Cooper, the jock, is the all-star baseball pitcher. And Simon, the outcast, is the creator of Bayview High’s notorious gossip app. Only, Simon never makes it out of that classroom. Before the end of detention, Simon’s dead. And according to investi­gators, his death wasn’t an accident. On Thursday, he died. But on Friday, he’d planned to post juicy reveals about all four of his high-profile classmates, which makes all four of them suspects in his murder. Or are they just the perfect patsies for a killer who’s still on the loose? Kicking off with a scene reminiscent of The Breakfast Club, this book begins with five Bayview High students in detention. There’s a jock, a bad boy, a beauty and a brain. There’s also Simon: an outcast responsible for creating the school’s popular and totally ruthless gossip app. Simon dies a perplexing death in that detention room and the other four teens suddenly find themselves under investigation for murder. This is a suspenseful, entertaining and highly addictive novel; it’s a clever thriller with some nice touches of humour and a little romance. The book is narrated in turns by our crew of high school clichés. 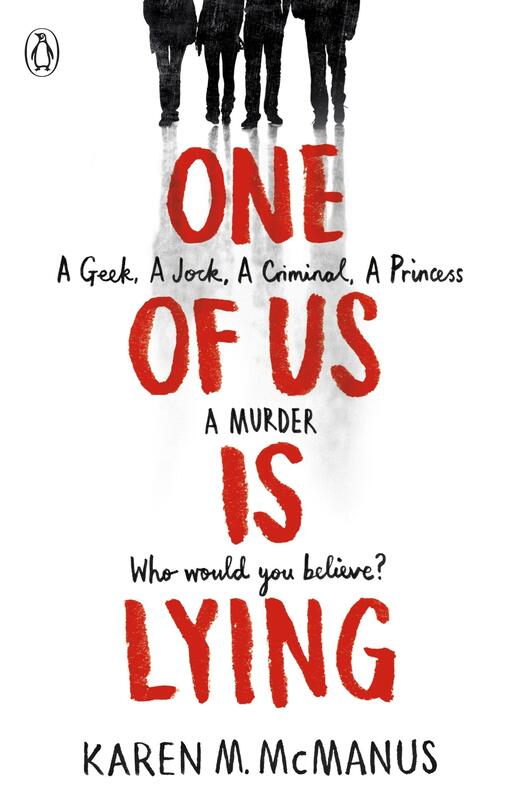 They find themselves banding together as they try to figure out what really happened to Simon, and who among them is lying, as the attention of the entire community shifts towards the group, and accusations and rumours begin to swarm. Surprising depths of character emerge and stereotypes crumble as we learn about the unique pressures and complications of their adolescent lives. We are drip-fed deep, dark secrets about each student – secrets that Simon had been planning to publish, secrets seemingly so ruinous they could be considered motive to kill. This is a fantastic, totally fun YA debut and the author has done a really great job of writing a plot that features a lot of social media but never comes across as corny. While there are similarities with Gossip Girl, this book is much more robust and real. Fans of Pretty Little Liars will absolutely eat it up and I won’t be at all surprised if we see One of Us Is Lying become a movie or Netflix series in the future! Kim Gruschow is the Children’s Book Buyer at Readings St Kilda.